There are times when itâ€™s not possible to find a home right on the beach but that doesnâ€™t mean one should give up on St. Simons real estate. There are many homes for sale or rent within minutes of the islandâ€™s best beach spots. 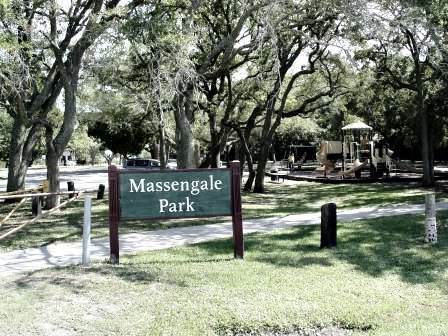 One popular area to settle is around Massengale Park. Open year-round, the park is close to residential homes as well as small businesses. Youâ€™ll find it located on Ocean Boulevard. It boasts ample, free parking, including spots close to the boardwalk and walking path that lead to the sand. The paved parking area also features public bathrooms. There is one building for the ladies and another for the men. They do not contain showers but there are sinks, hand dryers and towels where everyone may brush off a little sand. A childrenâ€™s play area and picnic spots are in the parking lot area as well. There is also a small, wooden bench on the boardwalk that is sheltered by a large, gnarled oak. As the boardwalk leads to the beach, itâ€™s a great place to change into your flip-flops or just roll up your pantsâ€™ legs for a bit of wading. Just beyond the bench, the boardwalk opens up to a small step-down that ultimately ends on to the sand. The sandy area is large enough to pitch an average size, pop-up tent or plop down a reclining, full-length chair for the day. Visitors are also welcome to bring food and non-alcoholic beverages in plastic containers right on to the beach. And by the way, there are garbage cans placed here and there too. So there is no need to leave the area with a bunch of garbage in tow. Just remember that the tides heavily impact this piece of St. Simons real estate. So, you may need to move your beach gear closer to the boardwalk as the daylight hours wane. Otherwise, you could end up with wet toes and soggy beach blankets at some point in the afternoon. To learn more about Massengale Park and the other beach spots frequented by people who own or rent St. Simons real estate, please contact one of our local DeLoach Sotheby’s International Realty Realtors today.